A resident at Country Meadows of Wyomissing uses his cane much less these days, despite having Parkinson’s disease. He credits a restorative fitness service newly available at the retirement community called Delay The Disease. We are the only retirement community in our service area with certified instructors leading the Delay the Disease™ program, the nation’s leading Parkinson’s disease fitness program. The exercise regimen is open to both our residents and non-residents with Parkinson’s disease and other mobility issues. Delay the Disease is a life-changing fitness, mobility and wellness program designed to enhance individual functioning and independence. Created by OhioHealth, it is an evidenced-based fitness program developed by David Zid, BA, ACE, APG, and Jackie Russell, RN, BSN, CNOR in Columbus, Ohio. This national wellness program is designed to retrain the mind and body and targets daily functional challenges and symptom-specific fitness agendas. Exercise plans are adapted to all levels of the disease, valuable to newly diagnosed and progressed states alike. It improves the physical, mental and emotional realities of Parkinson’s patients and delays progression of the disease. Though developed for those with Parkinson’s, it provides advantages for anyone who participates. Delay the Disease instructors guide participants in exercises that benefit their brain activity, gait, dexterity, fine motor skills, flexibility, strength training and more. 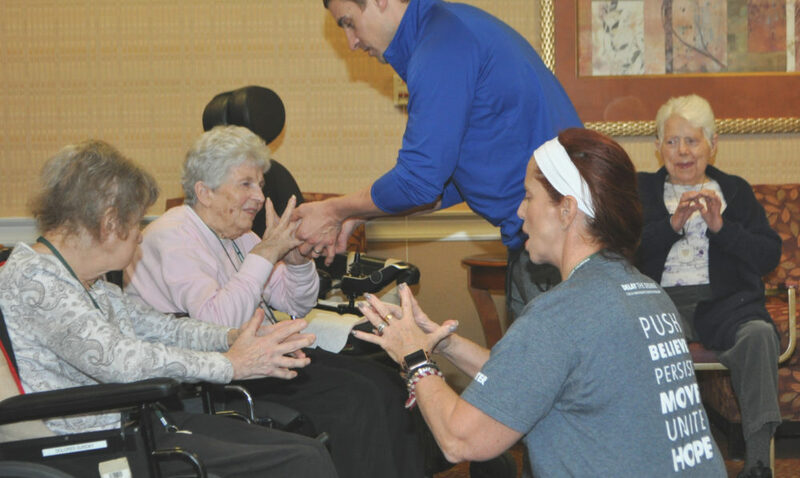 Vi Dao Schultz, fitness director at our active retirement community in Wyomissing, is certified to instruct Delay the Disease and is amazed at its effectiveness. She considers the resident who is able to walk without his cane a shining example of its success. Nationally, participants have experienced improved mobility, posture, balance, handwriting, speech volume and a reduction in daily functional challenges. Plus, the classes are known for their atmosphere of camaraderie and fun. Delay the Disease is currently licensed and available at no charge at Country Meadows Retirement Communities’ campuses in Mechanicsburg, Wyomissing, Hershey and South Hills of Pittsburgh. The goal is to eventually license the program at all of our locations, where the fitness and restorative teams are already trained in this unique program. At Country Meadows, we recognize that physical activity helps keep seniors healthy and independent. That’s why all our campuses have dedicated, full-time fitness directors, fitness centers and organized exercise and fitness classes for all levels of care and abilities. If you are looking for a retirement community in Pennsylvania or Maryland, we hope you will consider Country Meadows, where you will find enthusiastic residents engaged in wellness and fitness activities every day. We invite you to tour any of our 10 Pennsylvania retirement communities or our retirement community in Maryland. Please contact us for information or schedule a visit to meet our caring staff and become familiar with our full range of senior living services.